It is jelly/jam making season with an abundance of fresh fruit. 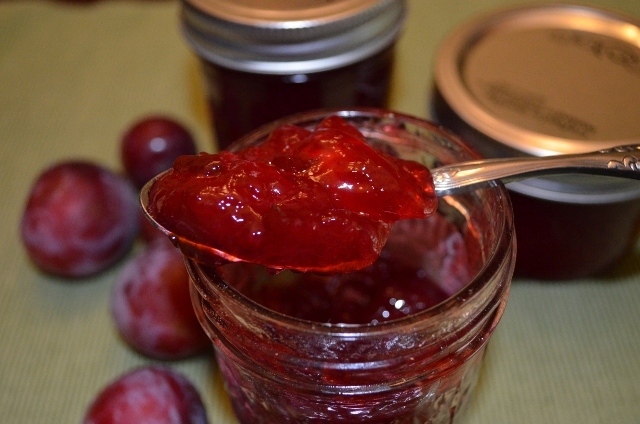 After going crazy picking plums, plum jam was definitely on the list of things to do. Our first plum to ripen is a small juicy plum which is called sugar plum. Sugar plums are great plum for jam or jelly or anything where you need a juicy plum. Enjoy! 1. Pit plums. Do not peel. Finely chop or grind fruit. Place fruit in saucepan; add water. Bring to boil. Reduce heat; cover and simmer 5 minutes. Measure exactly 6 cups prepared fruit into a large saucepan/pot. 2. Stir pectin into fruit in sauce pot. Bring mixture to full rolling boil (a boil that doesn’t stop bubbling when stirred) on high heat, stirring constantly. Stir in sugar. Return to full rolling boil and boil exactly 1 minute, stirring constantly. Remove from heat. Skim foam if necessary. 3. Ladel hot jelly into prepared jars, leaving 1/4 inch headspace. Wipe rim, Center lid on jar. Screw on band. 4. Process jars in boiling water container for 5 minutes. Remove jars and cool. Check lids for seal after 24 hours Lid should not flex up and down when center is pressed. Makes approximately 6 (8 oz) half pint jars. 5. Admire the beautiful jelly and enjoy the sweetness of summer!